I just finished DRT2 and can’t say enough good things about this program. As an older rider (age 65) who plans to continue riding for a long time to come, I’ve become more focused on staying fit, especially where flexibility and balance are concerned. 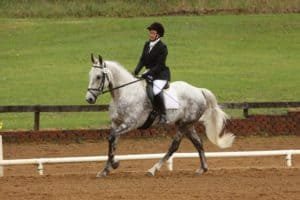 Dressage Rider Training, while not designed explicitly for older riders, was a great choice as it works on strength, flexibility and balance, in a graduated program where each week’s workout builds on the last one. I was concerned that, with 3 workouts a week that focus on different areas of fitness (core strength, yoga flexibility, and rider strength), there would not be enough consistency for an overall workout, but every workout, regardless of the area of focus, gives a good overall workout as well. Since each workout is different, there is plenty of variety to avoid boredom while still providing enough consistency to keep developing all the muscle groups. I hadn’t originally planned on moving on to DRT2, but the results I got with DRT1 were so impressive that I signed up for DRT2. I’ve been moderately active all my life, but after completing DRT1 and 2, I’m honestly in the best shape of my life! My neighbor was so impressed with the results I got that she signed up too! Hi Nicola, I have absolutely loved the programme, and have even grown some muscles in places where there were none! 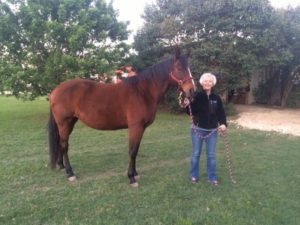 I am an adult learner rider and am a Parelli Natural Horsemanship student. I have recently submitted my Level 3 Freestyle audition which has a compulsory jump. Having never jumped in my life, this has been a big scary deal for me. This pic is of me (54) and Shadow (18) learning to jump. At a recent lesson we did standing in stirrups at walk and trot, hands on heads, arm circles, touching toes etc, and I could do it! I actually have a core and muscles that can cope! The biggest thing DRT has given me (aside from actually improving my strength, balance and flexibility) is the confidence to progress with my riding. Because I am more confident that I can cope physically, my mind is more confident. I had a bad fall a few years ago, and was shocked to discover that even though my body healed, my confidence has never really recovered, so I am very protective of it now. I am blown away at the exercises I can do now compared to when I began. I just can’t believe it! And all in 20min a day, and without lots of sweat and puff (well, there was a little bit). I have become way more aware of the unevenness in my body and where exactly it is, and am excited to have the tools to improve it. Thanks Nicola, it’s been amazing! Hi Nicola, I’d definitely recommend the programme, the workouts were the right duration and easy to fit into a busy lifestyle and they definitely improved my strength and flexibility. I just hope that the horse agrees that it’s benefited us! I went to a dressage competition on Sunday and she went very nicely despite the presence of some terrifying mirrors! Thanks again for setting up such an excellent programme, I’ll definitely be putting DRT2 on my list of things to do and I’ll await news for the sign up date. I’ll hopefully have done the repeat of weeks 6-12 by then! Thanks so much for the fabulous program. Pleasure riding is what I do, beach/forest with a few clinics here and there. I have really enjoyed the benefit of losing 4 kilos and lowering my stirrups by 2 holes! 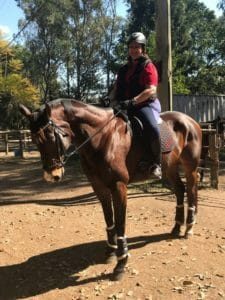 I look forward to seeing how I feel by the time I have completed your program, as I am thoroughly enjoying the improved stability in the saddle which is giving me a new found quiet confidence. Hi Nicola, Over the past couple of months, I have had to travel back and forth to the US, where my father was critically ill and then in hospice. He passed away on Nov 11th. While away the first time, in August and September, I was able to do Morning Yoga every day but got behind on DRT2 — I had no equipment, no space to work out and very little time. I credit Morning Yoga for keeping me sane during a very stressful time. I was back in NZ for most of October, and managed to catch up to Week 10. Then I was called home suddenly on Nov 3rd, and I have done nothing since. I flew the day I got the call, forgetting to pack my medicine. My body let down from the drugs that control Rheumatoid Arthritis and I have relapsed quite significantly. Although I am back in NZ now, I am in a lot of pain and can’t do any exercise until the meds kick in. So I still have 3 weeks left to complete DRT2. I probably need a couple more weeks of rest, so I’ve decided to start DRT2 over in early December, together with a handful of lovely women from the DRT2 Facebook group. All this is to say that I have been loving the program and feeling significant changes in overall fitness, strength, balance and coordination. 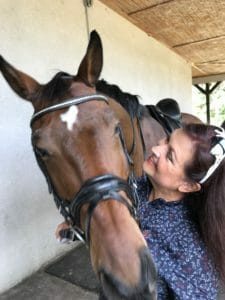 I have a fairly new horse, and I was beginning to make a connection and rediscover the feel of riding correctly — a feel that I lost when I was first struck down by the arthritis 6 years ago. I also had my confidence knocked (and my sacroiliac injured) by a bad fall when I returned to riding 3 years ago on a horse that proved to be unsuitable. DRT and DRT2 have been wonderful for my confidence as well as my fitness. Or maybe it’s the fitness that is enabling me to feel balanced, centered and connected in a way that boosts my confidence. Right now its all gone a bit pear-shaped, but I believe it will come back quickly when I am able to get back to my daily workouts. I really love Morning Yoga, and I do one nearly every day when I am well enough. And the DRT workouts at least 3 times a week, with added stretching and foam rolling. I walk my dogs 4 – 5k every day, too. Here’s a photo of me and my little horse, taken in October during a lesson with Manuela McLean. It was taken from a video, so it’s not very good quality. If you want to post this, feel free to edit the heck out of the what I have written above, pulling out the good bits. 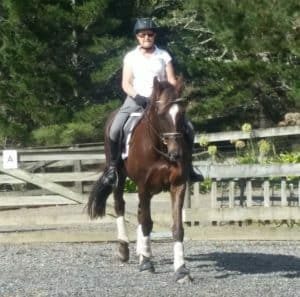 I’m not really a dressage rider, just a 60 year old woman who really wants to learn to ride correctly and be as balanced and flexible and strong as possible to be a good partner for my horse. Thanks for everything — your programs mean the world to me. I started this program because I was still recovering from some underlying vestibular (inner ear and balance) problems I was diagnosed with about two years ago. I feel like I have gained more balance and strength with Nicola’s program than I have in the past two years working with two different physical therapists. 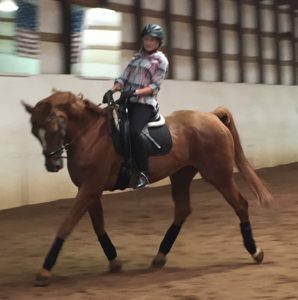 I am not a dressage rider, but I am very pleased with the results from this program. I am finally getting my confidence and balance back in the saddle. After completing both DRT 1&2, I have been able to take my riding to the next level. For me, this means due to strength and suppleness, I can access my independent seat all while remaining calm and relaxed up top. This means quiet hands and a responsive horse. My horse responds beautifully. 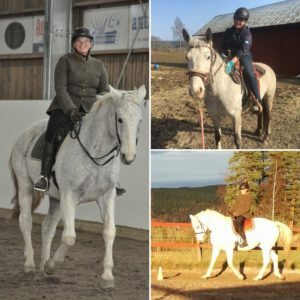 Only someone like Nicola with her unique qualifications of fitness expert and expert rider, could craft such a simple yet friendly program that is 100 percent effective if the rider is willing to put in the work. Most importantly, Nicola teaches you how to believe in yourself. The only way the program could improve is if Nicola was my trainer in real time and space. The DRT programs are the next best thing. Simple as that. Here’s a photo of me and my horse Charm. She’s a 17 year old quarter horse who has a natural gift for dressage—though I still have much to learn! 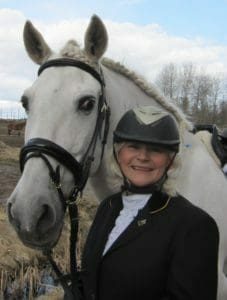 I am 67 and still work full time as a physician so my riding time is limited. I’ve been riding about 10 years and have had my horse 8 years. We live in central Texas and I keep her stabled with an incredible trainer. He and his wife are excellent at understanding horse (and rider) psychology. I’ve done Yoga for 45 years and do aerobics once or twice a week. I thoroughly enjoyed your dressage exercises and found them very helpful. I found I was just naturally riding with better balance and a deeper seat. My trainer commented last week: “I’m not used to seeing you ride like this!” So I appreciate all your help and look forward to the next part! I totally enjoyed the DRT program. I saw improvement in my balance, core, and overall strength with the innovative exercises that targeted what a rider needs. I highly recommend this to any level of riders. The program was easy to follow with lots of encouragement, and helpful information. After starting the DRT1 I could see tangible improvements in my riding very quickly. After four weeks I already sat deeper in the saddle and I had to lengthen the stirrups with 1-2 holes. After eight weeks (photo) my posture on the horse was clearly improved. My core muscles were already in rather good shape but I had and have a lot to do with the mobility and the strength. I still can’t do all the exercises of DRT1 but nevertheless, I am improving all the time. I will stick to my exercise routine and keep on enjoying the results I see as improved riding. My 5 year old horse is thanking you Nicola. 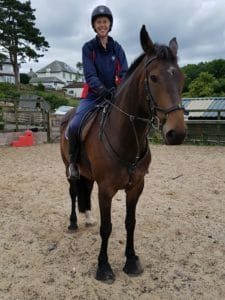 Hi Nicola, I came to riding late on in my 40’s and having done many other sports, I thought I was fit but horseriding disabused me of that belief. I have had a go at most disciplines but basically have been getting away with it. Then, after a particularly bad, confidence draining spook and fall, a friend sent me a link to your course. As a target for completing the course I entered a show jumping competition (v basic) which took place today and we came third. The confidence from increased core strength and balance (many attempts of rolling off the swiss ball into assorted furniture) paid dividends and my horse, Noddy, who is a spooky horse, never looked liked putting a foot wrong. Clearly he thought the pilot was more relaxed and not messing about! So many thanks – the key now is that I will continue with elements of the course as a weekly routine in order to protect my aging frame!! Hi Nicola, I have loved this program, specially yoga stretches. My horse has performed better as I have been more balanced and flexible. I’m turning 60 next year, it’s very important to exercise as I want to continue riding at least 10 more years. At the moment there is an unfortunate break to my training schedule as I am visiting family till January. Grandkids keep me busy, it’s somehow hard to withdraw myself away for exercises, daily schedule is totally different. But I don’t stress about it. When I return back home in Jan I resume back to the program. Btw its interesting how this program has motivated me in a different way compared to earlier ones I have had. I had all gym equipment at home but finally I gave them away as they were lying idle most of the time. It’s also very motivating to read the posts of other group memebers. Big thanks for those! I wish you, Nicola, and everybody joining the program a wonderful holiday time and memorable moments with your horses. In the pic is my 14 year old gelding Candi, he’s brought joy in my life already over 8 years and I hope we can spend many more years together. I am an older rider—70. My core is strong, but an injury had left me without much flexibility in my right hip. This was also affecting my balance. Of course, I had no idea about any of this until I started DRT. About halfway through the course, I started to feel the difference in my hips. My balance improved and I relaxed. As I relaxed, my horse seemed more sensitive to my aids. My stamina is better because I’m working more with my horse. Most important to me, though, is the boost in my confidence. I’m bolder about riding different horses and putting down the reins and riding from my seat with my horse on a longe line. Best of all, DRT is targeted to improve riding skills so I look forward to the workouts. To go to the gym or swim laps to stay fit has always been a battle with boredom. But DRT connects me to my horse and to riding. DRT makes sense, which swimming 30 laps never did. I also enjoy the blog articles that stress riding for your own journey, your own enjoyment, your own growth as a human being. I am looking forward to mastering that Swiss ball and the next course of DRT. Great investment! Hey Nicola, I truly enjoyed DRT2 and how well the program was organized. I thought you did a great job laying out the exercises allowing for progression throughout the program. 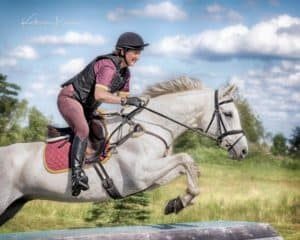 You focused on all the right areas, namely balance and proprioception, to help riders improve strength…which ultimately leads to skill development. I look forward to continuing the homework and waiting for DRT3 to come out! Hi Nicola, I just want to thank you so much for putting together these amazing programs. I completed DRT1 and am partway through DRT2 (I bought the thumb drive so will continue at my own pace) and I’m very determined to keep up the routine and maintain/improve the tone and fitness this time and just keep doing the workouts regularly. I have also saved a lot of your recipes which are delicious. I have told so many of my friends about your program. It has had such an amazing impact on my riding through increased body awareness, flexibility and strength – I have just loved it. I feel I have so many tools now and I am just so glad I came across the program. DRT 1 & DRT 2 have been a great way to advance my fitness on and off my horses. Not only has my fitness improved but also my body awareness, my ability to engage only what is needed and allow the rest to be supple, better balance, more energy and increased confidence! 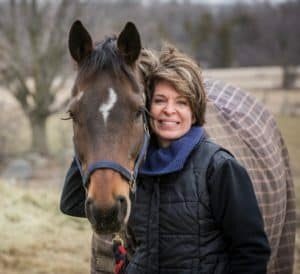 My motivation to ride better and be kinder to my horses by supporting myself and being able to guide my horses to healthier movement was always with me, keeping me motivated and rewarding me for my efforts. I started this Program in the winter when I was basically not able to ride here at home and as spring and summer have arrived they have brought heat, humidity and lots of rain. It’s been so comforting to know that while I can’t ride I can be improving to make the next ride as good as possible! My horses have shown me that I’m definitely on the right track! I found Nicola to be a great leader, very inspiring, strong, passionate, full of wisdom and yet very down to earth with a cheerful disposition and the ability to laugh at herself! I always felt welcome and no matter how small my questions were she took the time to respond. I LOVE all there is to partake in on the ONLINE GYM. The Morning Yoga program has become something I can’t walk out of the house without doing (currently I have completed 5 go rounds!). I find it loosens me up for the AM chores and sets me up to be mindful of what I have and consider how I want the day to go. I’ve also done the Yoga Retreat 1 (beautiful background to yoga to! ), currently going through the 30 Day Wellness Challenge and Wellness Guide. Lots of yummy recipes from food to body care! I’m looking forward to trying out the Yoga Retreat 2 after my final Rider Strength workout of DRT 2. Hoping for a DRT 3!! I bought the DRT1 program as a gift to myself for my 48th birthday. I have had intermittent problems with my lower back for years and had been in pain from a muscle spasm for about 6 weeks prior to starting the program. I was really hoping the program would help with my riding and back pain. The morning after the first workout I woke up with no pain! I haven’t looked back since! The program has also helped my shoulders and I found damaged muscle tissue in my right thigh, from an accident I had 18 years ago, that I didn’t even know was there! The foam rolling exercises have helped repair that tissue! Best of all, I am more balanced, secure and confident in the saddle. This program has truly been a gift and I am so glad I started these workouts! This has been a life changing experience for me! To be honest, I had been thinking about whether to move on to DRT2 or not until the very last minute. After completing DRT1, could feel my seat already much better, didn’t really feel that DRT2 was necessary for me but decided to give it a try anyway. I do lead a very busy life but since the workouts were only 20mins, could somehow manage to get them done, although I kept falling asleep while meditating !! I had been wanting to do some rider focused fitness work to improve my core and legs for riding especially after having a baby and trying to recover my strength. I saw the DRT and decided to give it a try. What a great program! The short sessions are easy to fit into busy schedules, the exercises target rider muscles and definitely helped to start balancing out my crooked body. The yoga’s were amazing for helping me to loosen up areas that were tight due to riding. I also love that I could download the videos so I can continue to go back and use them in the future to continue to improve my riding. I definitely have noticed a difference in my hips that are always tight from riding and an improvement in my core strength while I ride. 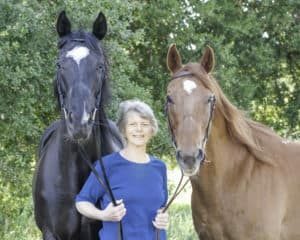 Last fall, I lost my best friend and riding companion Tea and Crumpets (TC) during colic surgery. He was an amazing horse – bred to work at Disney World driving Cinderella’s cart! He was the best teacher, willing to try anything and incredibly patient when I got it wrong. 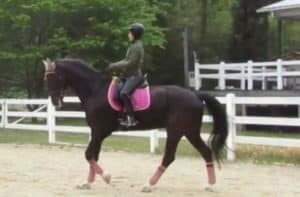 Over many years of dressage lessons on TC, my trainer would tell me that I needed to do more work off the horse to help loosen my hips. I kept thinking, what is she talking about, I exercise every day and am in pretty good shape for someone in their late 50’s. I ignored her advice – I was too busy to add more exercise. However, after the tragic loss of TC, I decided that I wanted to find a young dressage horse who would challenge me to become a better rider. 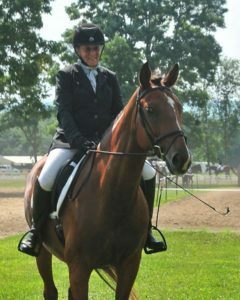 I found High Expectations (Hallie), a talented and smart 8-yr old chestnut Trakehner with lots of chrome and attitude! Her trot is expressive and big. Riding her I realized that my trainer was right all along, my hips were tight making it hard to keep my leg on and toes pointed forward. 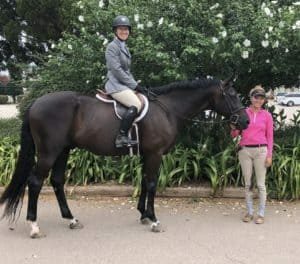 One of the other riders at the barn had just completed DRT1 and I could see first-hand how it was helping her with her horse, so I decided to give it a try. It was the best decision I could have made! I will never forget the day when I was doing my no stirrups “homework” on Hallie at the walk and felt my hips moving fluidly with hers, and she was moving forward and freely. It was a eureka moment! I think about my body parts differently now, thanks to Nicola and DRT1, and for the first time in my riding, I can isolate my core and keep everything else relaxed and moving with her. 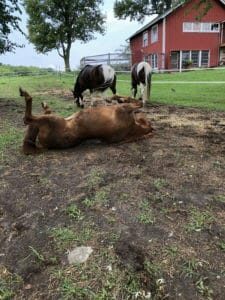 Hallie has also challenged me in some unexpected ways with some behavioral/pain issues that I am still trying to figure out with my trainer, farrier, and veterinarian. I posted about her issues on the DRT facebook page to maybe get some advice from the group. The response was overwhelming and extremely useful in helping me isolate her problem. I feel extremely lucky to be a part of this group. 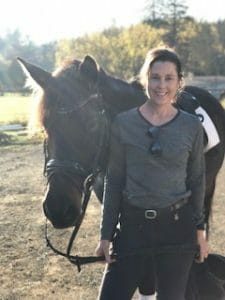 Thank you Nicola for developing this amazing workout program that is easy to fit into a hectic schedule, and that has significantly improved my riding, and many thanks to the DRT family for their unwavering support. I can’t wait to start DRT 2. 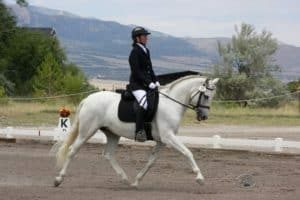 For two years prior to my participation in the DRT 1 and 2 programs, my horse and I were struggling with our partnership. He was hesitant to move into contact and collection, and I was working too hard to “make” him do it. I tried saddle fittings, chiropractic adjustments, more lessons, and feed changes. We were stuck, and neither of us was enjoying the process. I even began contemplating selling my horse and giving up riding. 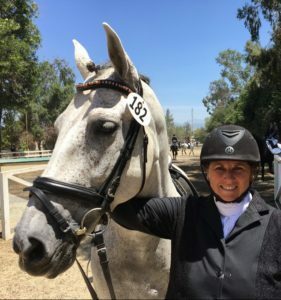 A comment from a dressage judge, while painful to hear at the time, made we realize what the underlying problem was – I was not a relaxed and balanced rider. The DRT program has helped me be able to isolate my core muscles from other muscles. I can now use specific muscles without tensing all of body, balance with my seat instead of my hands, and remain much softer with my aides, hands, and legs. My horse LOVES the change in my riding. He is lighter and more uphill in the contact. He responds more promptly to gentler aides. He is less crabby trying new things. His gaits are more suspended and open. He has become more affectionate towards me. Before the DRT programs, we were going 1st level and schooling a few 2nd level moves. 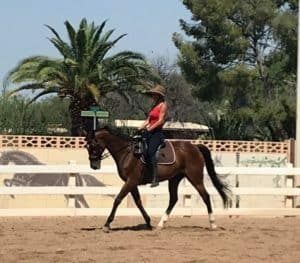 Now, after completing both programs, we are working on true extended trot (still need DRT3 to sit that trot), flying lead changes, canter half passes, and canter pirouettes. I have never felt more elegant as a rider, and our partnership is on a positive roll. I will keep working on DRT 2 until you come up with DRT 3! THANK YOU for sharing this program with us! 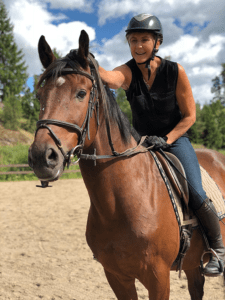 I’ve always wished I could specifically tailor my personal workouts to improving my dressage riding – and Nicola made it happen! In every workout, I felt I was improving my rider strength, balance and coordination- equating to improvement in the saddle. 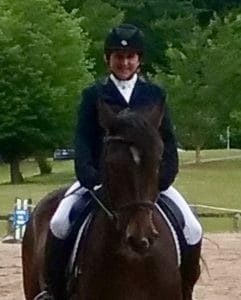 As a result, our dressage scores improved this season, and my mare and I are ready to move on to higher levels of accomplishment. Hi Nicola, I wasn´t doing any exercise before starting off with DRT. My riding was poor and my body was stiff. It was the DRT program that inspired me to get on the exercise track. When I started up the exercises it felt easy and you inspired me to continue. Today I start my days off with a DRT exercise and end up with the foam roller (what a great invention). I love the variety of all the exercises and also that you can do it on your own level. The length of the program is perfect and can be fit into a busy day. If I try to skip out one time I feel like I forgot to dress before leaving home. My riding has improved a lot and my trainer told me that I have better balance in the saddle. I have also improved my aids and have more control over my body. I am really looking forward to DRT3. I continue to do the exercises from DRT1 and 2 and challenge myself pushing a little bit harder. I have never ever regretted that I started with this online training. This is so spot on right for me. Also one more thing, The Facebook groups are so great. Everyone is so supportive and it is so inspiring to read all the posts there. It’s so great to have contact with everyone that is on the same program. It’s like a great happy buzzy bee fan club! Great job Nicola and Ben. Thank you. Keeping my fingers crossed for DRT3. Sunny and warm regards from Sweden. Hi Nicola, I loved both DRT 1 & 2. DRT2 was definitely a step up! I found the DRT programs more productive than 1:1 time spent with a Physical Therapist and/or Personal Fitness Trainer. My core feels much stronger- particularly lower abs, obliques and all the little balancing muscles. Yoga was really difficult for me but it definitely helped with flexibility. Thank you for putting together a great program. I’m looking forward to DRT3! …..Oh, and a bonus… “F*#king hip!” is no longer part of my daily vocabulary. Really happy to NOT have hip pain! Hi Nicola, Thank you so much for creating the DRT program it’s exactly what I needed for both my riding and my every day fitness. I’ve just turned 50 and feel better than I’ve done in a long time. I feel so much stronger in all the right places, especially in the areas that support my lower back, and haven’t had any of my usual lower back pain thanks to the program. I’ve really enjoyed the variety of workouts and homework which have been interesting, which has helped with my motivation. Also your excellent explanations have given me much greater awareness. Unfortunately, my lovely mare is off work at the moment, but when I’ve been riding friends horses I’ve felt much stronger and quieter in the saddle. I’ve also had greater awareness of what my body has been doing and the impact it has on the horse. Really love the concept of relaxation making sure the right muscles are working and the rest are relaxed. I’m looking forward to feeling the benefit when Maggie is fit again. Until then I’ll make do with the Swiss ball (which I managed to master eventually – another example of something I thought impossible becoming possible thanks to your program)! 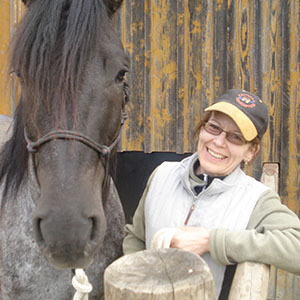 Hi Nicola, I have attached a photo of me and my horse, Stoli. I have had him for over 10 years! We show in the hunters and live in NC. I have really enjoyed the DRT program and feel it has really helped my riding and life as a whole. I feel stronger and more secure in the saddle and therefore I am more confident! Hi Nicola, This is my horse Harry. We recently completed at the Brisbane CDI. I found the DRT program very motivating & it certainly helped with my riding position. I will definitely be continuing with the program. 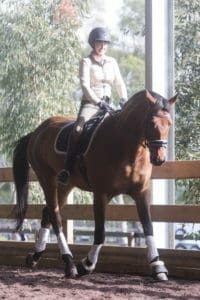 Hi Nicola, This is my young boy Jester – a Lusitana Fresian cross, who was started in March this year. I have appreciated your focus on relaxing, balance and being able to turn on the only the muscles needed to give the aids. Hopefully Jester appreciates it too – I have benefited a lot from improved balance which is so helpful as Jester is still working out his balance under a rider. The sitting trot practice has been really good for me, if not so much fun for my older horse. I am redoing the last phase of your program, and looking forward to the next round, as somehow you keep making it even more challenging. Many thanks for a great program. To say the past four years have been eventful would be an understatement! I turned 50 and was diagnosed with breast cancer. In the process of the treatment, I was plunged into menopause and side effects from radiation and medication were taking a toll on my body. I started riding again after almost 20 years out of the saddle and this soon became the highlight of my week and was my one constant throughout my treatments. I decided life was too short and so fulfilled a life long dream of owning my own horse. Benji came into my life just over a year ago. 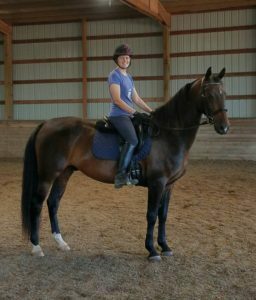 A beautiful 17.1hh, 13 year old OTTB show jumper who also had a really good basic dressage education. One month after buying him, I came off! I fractured my pelvis in a few places and was basically bed ridden for about three months. My fall was no fault of my horse but was directly related to my lack of strength and fitness. I just wasn’t able to cope with a relatively minor stumble and I obviously didn’t bounce as well as I used to! 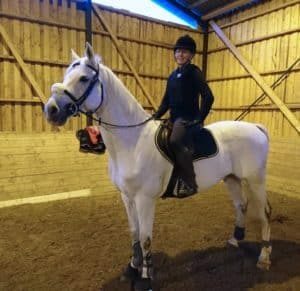 After months of physio, rehab and exercise, (oh, and a knee operation), I finally got back in the saddle, and after six months finally had the courage and strength to get back up on Benji. Sadly, he then had a nasty hock kick – an injury which put him out of action for about three months. It was during this time that I decided to join the DRT program. Benji now needed me to be fit, strong and healthy to help him with his recovery. With huge support from Nicola and the DRT group of wonderful riders, I got through the program. Even managed to have my appendix out and, even though I got a bit behind the group, their support and Nicolas help got me to the finish line. What I really loved was the ability to do the exercises at my own time and pace and to be able to tailor the exercises around my injuries and weaknesses. I would go back over previous exercise routines where I felt I needed a bit more work. 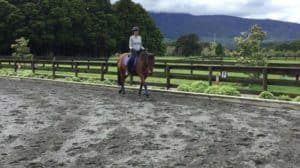 It certainly worked for me and for Benji.I would thoroughly recommend this program to anyone wanting to get the most out of their riding and their bodies. Thank you Nicola! The benefits of the DRT 1 program were more than I expected. I felt like I was fairly on top of my fitness when I heard about the program and I thought that some fine-tuning would be helpful, so I signed up. DRT 1 was so much more than fine tuning and I was pleasantly surprised by how much changed in my body and my confidence. I am now stronger in all aspects of my body and my balance and flexibility have also improved. I can actually feel when my seat bones are not even and I can also feel when my lower leg is moving around too much. In the past, my trainer had to tell me about these things because I could never feel them for myself. She has told me that she can see that my lower leg is now quieter and that I am much more aware of my body. As my body has quieted and become more effective, my horse is now more responsive and more forward. The partnership my horse and I have feels closer than ever and we are working together rather than against each other. One of the moments that really stands out for me was the day I was riding without stirrups and did a downward transition from canter to trot. 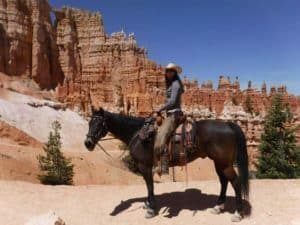 In the past I would lose all coordination and centeredness in that downward transition, but on this day, I was quiet and centered in the saddle. I would recommend this program to any rider regardless of discipline. I am going to keep working through the last phase of the program to maintain my progress until DRT 2 is up and running. With this program I have finally found a way to fit the training into my busy days. I have been quite active even before the program but struggled to find a sustainable routine between full time work and horses. 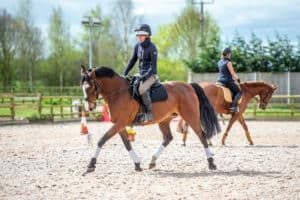 I have also felt like I wanted to focus my workouts around exercises that improves my skills as a dressage rider, but lacked some of the tools which DRT now has given me. The short workouts can be done even when you return home late from the stable and it is really nice to have Nicola taking you through the exercises so you don’t have to think, just do what she says. Best part is that I really notice results! My core strength has improved a lot and I am much more balanced on the horse. This makes it so much easier to follow the movements of the horse and ride with independent hands and legs. I really look forward to continue with DRT and excited about what the future will bring! I am so happy that I decided to follow this DRT programme. It came at exactly the right time having just given up my office job and moved from Germany to Austria to pursue full time, my horsey activities! It has been great fun doing all the training sessions and at the same time quite challenging. My body has gained strength and my balance has improved enormously (this had deteriorated following a blocked eye vein a couple of years ago which has left me with diminished sight) especially with the gym ball work. Not only that, but I regained my self-confidence after my youngster Finn (in the picture) spooked and took off leaving me draped over the fence last year! After completing the DRT 12 weeks, I feel stronger and my much improved riding and body awareness has helped Finn and me to redevelop our partnership so that we are both physically better and thus happy and relaxed. 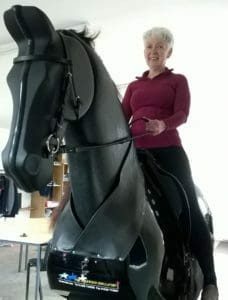 Thank you so much Nicola for the fantastic programme – it is just perfect for the busy lives of horsey people, whatever age (I’m 60 plus and never felt fitter). ‘Looking forward to more of this! The DRT program was excellent! 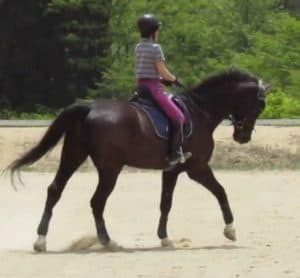 I’m a mature, amateur dressage rider and found this program really helped me with my core strength, balance in my seat and my horse, Milo, really appreciated the improvements! He is more forward off my leg, supples more easily through his back and is so much more giving now because I can communicate my aides just that much more effectively. Thank you for your ever encouraging words in all of your workouts… they gave me confidence all the way through and the results really proved that this investment was worth it! Thank you Nicola! I look forward to DRT 2. Here is a picture of my beloved Thoroughbred, Milo. 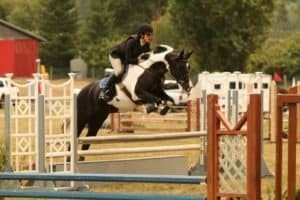 I am eventer who was coming back from a back injury that left me in bed on pain medication more than once. My doctor wanted me to find a program that would focus on the muscles used for riding because although I did Pilates Barre 3-5 days a week, I was overworking some muscles and missing others. I also needed something that would start me back slowly as I was terrified about re-injuring myself. DRT was the perfect program for my needs! It started out slow and systematically and provided me with additional homework and insight into what my body needed. Some weeks I’d add in additional strength sessions, others I needed yoga. It has been a wonderful experience well worth the time and money. 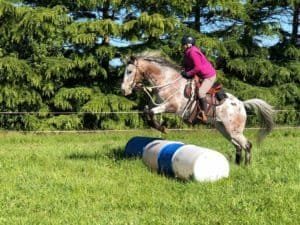 I’ve struggled with tight hips most of my riding career and have difficulty getting them back over fences, DRT has certainly helped the problem improve! 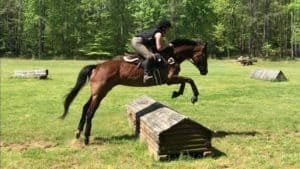 My eventer Connell is incredibly athletic but I’ve been able to work sitting trot back into our work sessions without any pain and we are looking forward to a great show season this Autumn! Thank you! So,much to say, Nicola and Ben. In short: love the program and will keep on going. It‘s become less about achievement and more about confidence, joy in and with movement, feeling, body and soul. Yes, confidence as I’ve worked on strength and view I guess? It‘s been hard and challenging and I‘m not through with the program – lacking the swiss ball. But so much more core strength and flexibility – at the age of 52 – like never before. I‘m actually stunned how much more of a response I see and feel in my horse. so a huge thank you for all your efforts, also on the technical side – things always went fluid, fast and positive. Looking forward to what‘s to come! Dear Nicola, I embarked on the DRT journey at the beginning of the year never anticipating the benefit that I would gain from the program. DRT2 has allowed me to build on the foundation that I achieved from the first stage. My core stability has improved beyond belief and my strength has also increased to a point where my instructor rarely has to ask me for more leg any more. My horse Max and I have gone from strength to strength because my balance is better and I have much more stamina. I have even had the confidence to do some jumping this summer for the first time in 3 years! I can’t recommend the program enough and am going to repeat parts of it while I eagerly await DRT3. Thank Nicola for giving me such a great program to work through I can’t tell you how much difference it has made. I started the DRT1 program almost a year ago, not knowing what to expect or if I’d even keep up with it. Would I lose interest or just struggle to find the time to fit in the exercises or just make excuses to skip it today? So almost a year later and here I am in the middle of DRT2. I haven’t lost interest and don’t think about skipping it. It’s part of my daily routine and if I skip it, I miss it! Nicola is encouraging and has created a program that is just perfect for me. The DRT program has given me the physical strength and conscious awareness of my self and body that I need while riding. Love the DRT program! I have just finished Drt 1 and I am now taking part in Drt 2 . 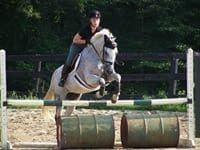 I am a novice rider and get to ride for just one hour a week. I was interested in doing the Drt programme to help me get the most out of this precious time. I really enjoyed the workouts and I am much stronger as a result of them. I feel they have improved my balance and position on the horse. The 20 minute duration makes them easy to fit into my schedule. Thank you Nicola for this fantastic programme! As an eventer, DRT has been an incredibly positive experience for me across all three disciplines. I have seen improvements in the independence of my aids and in the strength of my core. My OTTB mare is very sensitive in the bridle and it is imperative I am able to be soft and reflexive with my hands. DRT1 really helped me develop an independent seat and leg and use these aids much more efficiently, as well as being steadier and more consistent with contact. 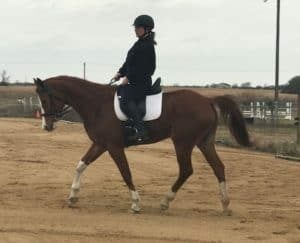 In addition to the improvements in dressage, my forward galloping position for XC is much stronger and I feel more confident in being able to focus on the task at hand! I’ve just finished DRT1 and I loved it, it has improved my overall fitness, my posture and my riding, and even my mindset! Less pain in the hips, still got issues but try to work through it. The bonus is that I’ve also lost a few kg’s even without a good eating plan ? I want to continue this journey towards a better and fitter me and become a better rider for my horses. With the youngster I’m starting under saddle now, balance and good aids are essential. 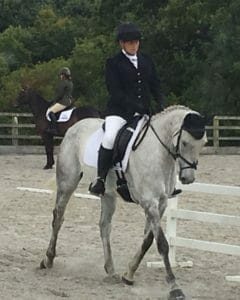 I have ridden for quite a long time and have gone from low level eventing to dressage in the last few years. About 2 years ago something was happening that disturbed me. I used to come out of a class and be greeted with “nice ride” or “lovely horse” etc. Then it changed to “you are such an inspiration” What? Really? It was all meant well but what happened here to throw the switch. Was it because I was old, stayed on my horse and remembered test?? It reminded me of when I brought home an Irish horse. He was huge, angular, a bit rough coated, basic bay with no white. He had a great eye and was the finest horse I have had the privilege of owning. I invited a friend to come see him as I was so excited to finally have him home. My friend stood there shifting from foot to foot, clearly uncomfortable with what he was seeing. Finally he said “gee, he’s really brown” What??? I have gone back and looked at photos of me and looked at my test scores and finally knew what the problem was. I have always been fit from skiing and running etc but not rider fit. In the photos I was round shouldered and slumping, I looked happy but not determined. DRT has changed all that. I have been working hard on the programs both for fitness and awareness of my body and intent. It has helped beyond belief. I am happier, more confident and more focused while I ride and my horse is going really well. And I am fine with this!! Thank you DRT and Nicola. 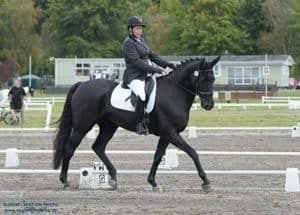 Just wanted to touch base and thank you so much for creating the Dressage Rider Training Programme, I am just finishing Week 12 and have signed up for DRT2. This is the first time I have stuck to a workout programme from start to finish. The workouts are fabulous I look forward to each and every one of them, and often repeat them. I have noticed a huge difference in my straightness, I have a real tendency to collapse my right ribs, due to a fall a few years ago. I can now look at photos and video of myself without cringing! 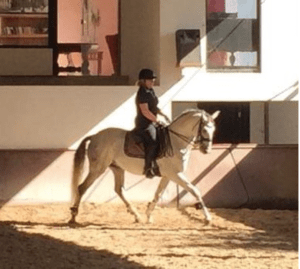 I am starting to do some higher level movements with my horse now – canter half pass and flying changes, so this programme has been invaluable in helping me isolate and use muscles independently. I have a long way to go, but with the help of DRT2 about to start I know I’m on the right track. I have been telling everyone about your programme and trying to encourage them to sign up. I think part of the greatness is the comradery of all the other participants. The FB Page is just fabulous, everyone is so supportive and helpful, especially if you are having a bad day and need some encouragement. I look forward to continuing the DRT Journey. I would describe myself as a cautious rider, not as confident as I would like to be. I am a recreational rider tho I love clinics and lessons. 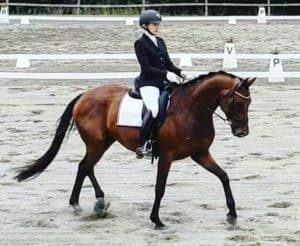 Did my first dressage show last year in intro. Enjoyed and noted what I needed to improve. And that is why I signed on for this online program. Bella and I don’t go over fences much anymore, she is a 20 yr old arab/tb cross and I am approaching my mid 60’s. this program has given me the tools to better balance, isolate and confidently make mistakes in my riding! I will be signing up for drt 2 and will also take advantage of the yoga programs offered. Nicola Smith has put together a comprehensive program that will complement any and all training one is currently engaged in. This all from someone who does not join things readily! So thank you Nicola and the entire global online community of dressage rider training! I’m not a horse owner, but DRT has helped me make the most of precious weekly school lessons. I’ve enjoyed everything about it. It’s improved my balance, co-ordination, control, strength, position, stamina, independent seat, rising trot mechanism, even getting on and off(!). I’m much more aware of how different parts of my body influence the horse. It’s changed my attitude and I now see myself as an athlete. After a long gap I had returned to riding a few months ago. Dismayed at how puffed and unbalanced I was and how little flexibility I had in my hips, I signed up for DRT1. Since then I’ve ridden 5 different horses – 6 including a dressage simulator – with four wonderful teachers, read books, watched videos and masterclasses, patted Valegro, done my first dressage test and worked through DRT. Biggest surprise came in week 6 when I looked in a mirror and could actually see core muscles developing – but I’ll spare you a photo. The biggest weakness for me is hip flexibility. DRT gave me targeted exercises which I can carry on with. I have never found an exercise class that I liked, but I really enjoyed my 20 minutes up in the loft with Nicola in the NZ sunshine. Often the workouts coincided with what I’d been working on in my lessons. Every exercise had a relevant purpose. The encouragement from Nicola and the online DRT community has been outstanding. In my professional life, for 25 years I’ve designed and run workshops and distance learning courses. I’d have been proud to design DRT. Nicola, huge thanks to you. Hi Nicola, Just wanted to send you a big THANK YOU for designing such an easy programme to follow that really gets results. I like the short format workouts which you can fit into your schedule at any time. 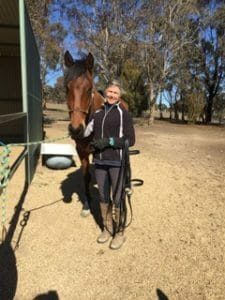 I have found the stretching part of DRT particularly helpful as riding and working on a dairy farm tends to make everything quite tight and it is great to have a collection of stretches to loosen me up. 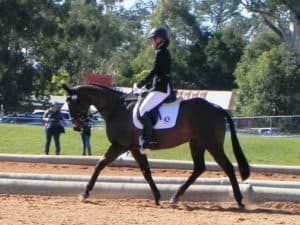 I am now 27 weeks pregnant and credit DRT with allowing me to continue riding competitively, even stepping up to NZ Level 3 with a young horse and doing all of the sitting trot. My midwife cannot believe how active and supple I am! Although I can’t do a lot of the full workouts at the moment I still piece together parts of the workouts I can do to keep me loose and balanced. I’m really looking forward to getting stuck into DRT 2 once I have my baby to help get my body back where it needs to be. I absolutely love the program & have at least 2 friends starting in May. I think 1 of my students will be taking it too & possibly another friend who had purchased it but never started. I have almost completed week 8 (late start & repeated 1-2) & I definitely want to do DRT2 but I think I need to redo 5-8 I have been amazed at some of the exercises that I didn’t think I could do but I even did the hardest version but I do have some limitations (knees) I am 70 years young & have goals I want to achieve. You are definitely putting me on the right path. If there is anyone out there who thinks they are too old to do your program, they are WRONG! I don’t want to miss out on DRT2 but am afraid I will be starting it too late. I don’t want to stop! I plan on continuing to promote your program to all my friends, students, acquaintances, etc. 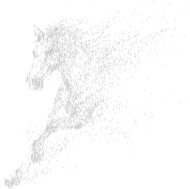 You are providing a very important service to the dressage community at large & in a very fun & personable manner. I loved the ending on week 8 yoga! Thank you!! I was and still am very much interessted in everything about the seat at riding. Because I deeply belief that with a correct seat your horse will work correctly under you almost by itself. I tested a lot of different thing – like Franklin Balls, different teachers, different books and different methods. In each sequence I learnt something no doubt. But it was never the big breakthrough. In 2016 I had a disc prolapse and couldn’t ride for a while although I just bought my first own horse. Actually I already wanted to start your program in 2017. But I knew I had to take it step by step and very slowly to build up again. So I didn’t join. But this year I felt already strong enough and I knew that I had to do something different to meet the big movements of my horse if I wouldn’t get another prolapse. So I started the DRT 1. And with each week I just could feel the difference that the program brought to me and my riding. I got stronger, more flexible, more connected – I don’t know. 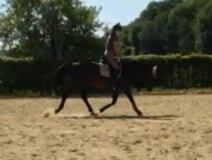 But the biggest surprise was the ultimate response of my horse to each improvement that I made. After completing DRT 1 I can do sitting trot despite his big movements. I can canter in a very nice and round way. He listens to me and may aids. And all the people around me see the big progress my horse has done over the last couple of weeks. And this is due to you, Nicola, and your program!! Thank you very much for all!! And I am really excited about to see what kind of changes the DRT 2 will bring to me and my horse! I am really pleased with myself for having signed up for DRT!! This program has helped me so much to improve my seat and core. 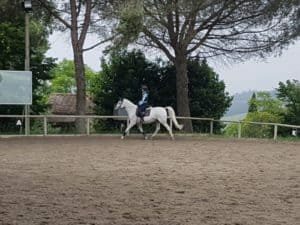 My partner is a big powerful KWPN, he can be quite spooky, but I can now stay on him without losing my balance most of the time:-) Also, had difficulties doing 4 tempi changes but after having finished this wonderful program, we are doing 2 tempi changes without any problem!! Thank you very much for having created such a fabulous program Nicola! Hi Nicola, I really enjoyed the DRT program, and I am thrilled with the results. 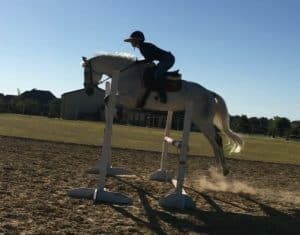 My seat, balance, core strength, and flexibility have all benefitted significantly, and both my coach and my horse, Murphy, have noticed the improvements! The 20 min videos are easy to fit into the daily routine and are challenging without being overwhelming. I especially enjoy the unscripted visits from Nicola’s horse and dog! I have recommended the program to all my rider friends! Thanks, Nicola, for providing such a fun, positive, and effective program! Murphy and I are both looking forward to DRT2! 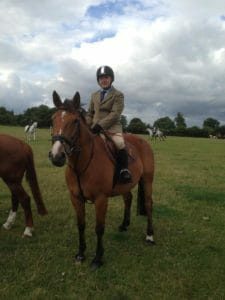 I took up DRT shortly after realising that I had become an owner of a very capable horse. My riding was less mediocre, far less. I had taken up riding a couple of years earlier for the first time after teenage. DRT was appealing as it promised results in relatively short time and with minimum effort. I had a bit of a history of several sports and power training, which all seemed too much of since life interfered. Now I was 51 years, my physical condition had deteriorated close to nothing and I had no energy to even think about committing an hour at a time at the gym, plus change of clothes, shower and all that. 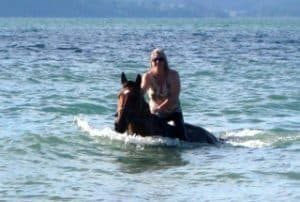 My goal was to make life easier for my gentleman of a horse, who soon enough had learned to take advance of my poor riding and really showed me my true skills. Regardless, I had a secret wish to be able to jump properly and even attend a show or two someday. I began as a mere passenger on a horse who could have done a smaller show on his own. Off I went with DRT. Starting with easy stuff and progressing slyly to the level where you suddenly realise your core actually holds something, your legs are getting more even with strength and you can actually balance on a swiss ball. All this with 20 min passes three times a week for some 12 weeks. Then came the day I got a new trainer. A guy who has been working on young horses preparing them for competitions. As he did not know us we started off with some 70-80 cm fences. This was already at my top height. He was very pleased to see us jump. And he kept adding height and technicality. We ended up jumping 100-110 cm fences in several different compositions. My horse was flying with enthusiasm. I managed to keep up with him, even at the biggest fences where he took some extra air underneath, and my trainer kept saying how pleased he was. I was astonished to realise he was actually responding to my seat better, and I could keep my posture and legs more still than ever before. Little did the trainer know that I had gone way past my comfort zone! I’m so happy I came across this program which has given a great rhythm in working out and noticeable results. I still have a lot of work to do, but never have I been riding with so much ease and confidence than after these 12 weeks.